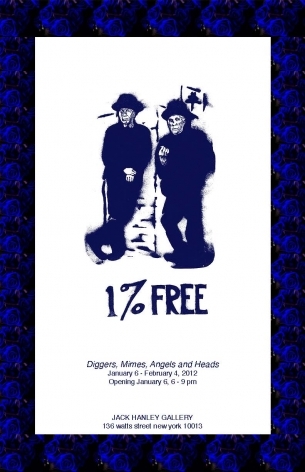 The Jack Hanley Gallery is pleased to present Diggers, Mimes, Angels and Heads, an archival exhibition of the San Francisco social activist and counter-cultural scene from 1966 to 1968. The exhibition will include photographs, posters, periodicals and other printed ephemera. At this moment, with the Occupy Wall Street movement offering up the thought of less capitalism and shifting the values of a money-oriented society, it seems timely to remember The Diggers--and a different use of the 1%. 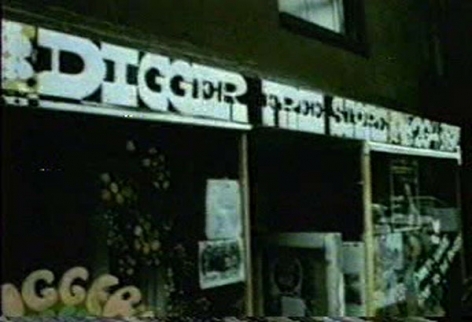 The Diggers, a loosely based gang of improv actors from the San Francisco Mime Troupe and their anarchist/absurdist friends, formed in 1966 and were active until about 1968 in the Haight- Ashbury neighborhood of San Francisco. These "activists" considered it “dribble” to have 10,000 people marching around the Federal Building to protest the war. But how great, they thought, would it be to have 10,000 people march around the Federal Building for no reason at all. Absurdity was their medium of activation. Yet, so was the very way in which they lived. The Diggers avoided the symbolic ideals of political protest by offering free food everyday at 4pm in Golden Gate Park. 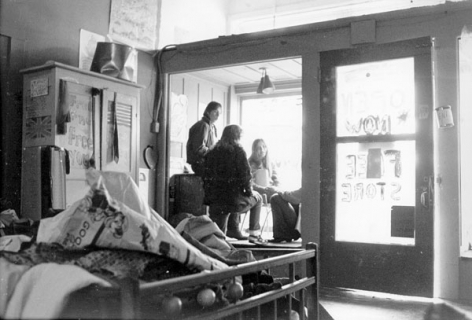 With the creation of Free Stores, a Free Bank, a free medical clinic (which still exists today as the Haight-Ashbury Free Clinic) and the Free Frame of Reference, a storefront that provided free film screenings and poetry readings, the 1% that made up the counter-culture was beginning to break free. Like many other counter-cultural groups of the time, the Hell's Angels and the Heads, the Diggers embraced and fought for those ousted by the structures of society, those that were considered to be the 1%. 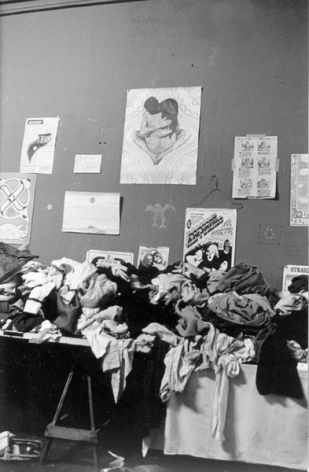 A history of their action lives most heavily in the printed materials that were distributed daily and the altruistic practices that still exist today like the Daily Free Meal Program at Glide Memorial Church. Engaging action as a value to be shared and exchanged, the Diggers and other San Francisco counter-cultural groups of the late 1960ʼs set the stage for many of the practices alive today on our streets and in our cities. This exhibition surveys the moment when the 1% represented something entirely different.